So here's something I found in Mitsuwa, which has an excellent selection of Japanese drinks. They're not cheap, but they're good and entertaining. Like the tagline of ハニップＣ. I only bought it because it had a plum at the bottom *and* weird English, thus was worth the higher price. Basically, I've never seen anything like it in the US, and I like novelties. So let's deconstruct this for a moment. It's not totally weird English because it makes sense, sort of. American companies wouldn't use the word "tastiness" to describe a drink, but rather "flavor," and they'd use animated adjectives to modify "flavor" to entice the consumer to purchase the delicious drink. Or they'd just simply say the drink is "tasty." 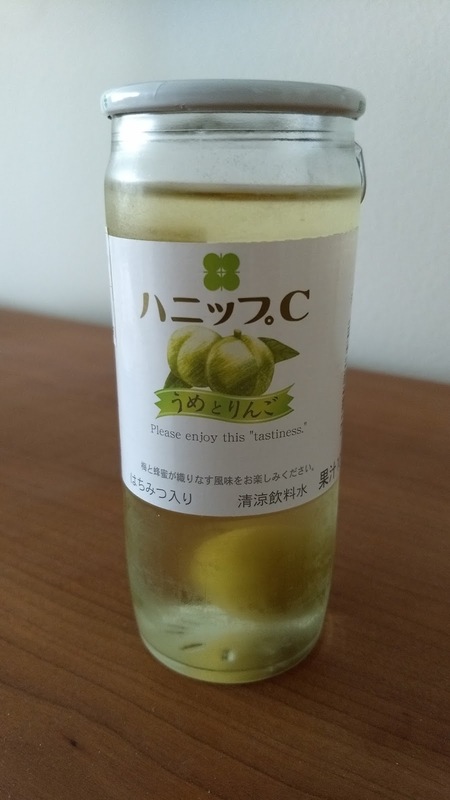 But this Japanese company, プラム (Plum), not only uses "tastiness," but puts quotation marks around it. Why? Are they implying that the suggestion is "tastiness" but the reality is different? Are they using the quotation marks to admit to falling short of flavor expectations? Is it a textual version of a wink and a nod? Also what's not typical English is the request "Please enjoy..." as if they're trying to be polite yet firm. It would be harsher, of course, to simply say "Enjoy this tastiness," especially in apologetic, self-effacing Japanese culture. Realistically, products don't usually have any kind of request, but boldly proclaim how great they are and how they'll make you feel, which should convince you to buy them. But in this case, the sentence is literal but awkward, because of the combination of words, ending with the quotes. Overall, it comes off as stilted and sarcastic, which was most likely not the company's intention. Below the English sentence it says "Please enjoy the blended flavor of plum and honey." On the bottom it says "contains honey" on the left and "refreshing drinking water" on the right, though I'm wondering why they say "water" when it tastes like juice. Next to that it says "less than 10% fruit juice." Okay, so it's not technically juice, but it hardly tastes like mere flavored water. Thus the mysteries are numerous, but it doesn't deter me from purchasing other weirdly-worded products, whose "tastiness" I'm willing to explore. So I might have something else to post on such a topic in the future.